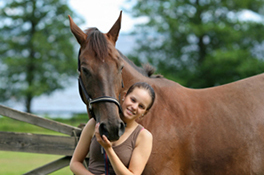 Improve your riding with Pilates and take it to a whole new level with one of the most important relationships in your life, the one between you and your horse. A stronger core to help you avoid collapses, twisting, bouncing or bobbing your body in the saddle. A stronger core to absorb the movement of the horse. Improved balance equals the greater the degree of balance within the rider’s body off the horse, the easier to maintain balance on the horse. A stronger and more flexible back. Better posture to help you deepen your seat. Better health and comfort during and after your ride. 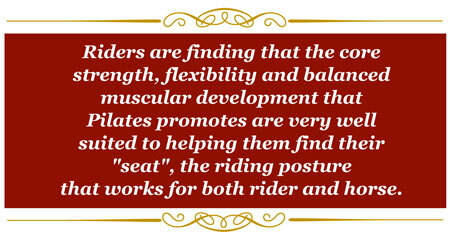 Increased flexibility allows the rider to sit up. And what can all of this lead to? In other words, a great ride! 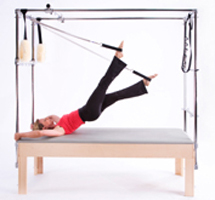 Equestrian Pilates accomplishes this by conditioning the equestrian. Laura’s Ultimate Pilates offers a wide range of group, semi-private and private classes, all with one goal in mind – to transform our client’s bodies! Visit our Class Descriptions page to learn more.